First, make the granola: place the oats, seed mix and lemon juice in a mixing bowl. Stir in the honey then spread the mixture onto a baking tray. Bake for 10–15 minutes until golden. Dip 2 of the fresh strawberries into the chocolate, coat well and leave on some baking paper to set. Hull and quarter the remaining 6 fresh strawberries, place in a deep bowl and top with the yogurt. 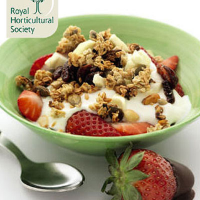 When the granola is cooked, add the dried strawberries and chopped apple, and serve with the yogurt, the fresh strawberries and the chocolate-coated strawberries.